NBC 5 meteorologist Kalee Dionne has your latest forecast update. A Severe Thunderstorm Warning is in effect until 11:15 p.m. for Jasper and Newton Counties in Indiana. At 10:34 p.m., a severe thunderstorm was located over Sheldon, moving east at 35 MPH, according to the National Weather Service. 60 MPH wind gusts are expected with the storm, which also spawned warnings in Central Illinois. A Severe Thunderstorm Watch remains in effect until 1 a.m. for Kankakee County in Illinois and two counties in Indiana. The watch in Indiana includes Jasper and Newton counties and will expire at 1 a.m. Central (2 a.m. Eastern time). The watch is part of a weather system moving into the area that has the potential to spawn severe weather. 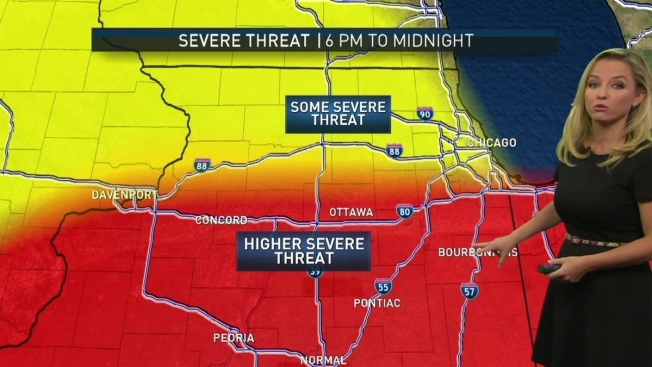 The threat of isolated tornadoes is higher in the area south of I-80, though the entire region remains under an elevated risk for severe weather. Wind gusts of up to 70 MPH are possible, along with half-dollar size hail and a chance of localized flooding in some areas. High temperatures sit between 85 and 90 degrees during the day on Saturday, with lows dropping to the upper 60s at night. Sunday looks to be calmer, with partly to mostly sunny skies and temperatures in the upper 70s to 80s to make for a breezy and pleasant day. That won’t last long, as the chance of showers returns Monday and remains each day through the week.